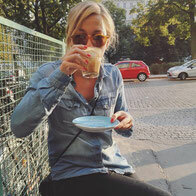 If you don't know where to get the best coffee in Berlin, here are our top 5 cafés in Berlin. Here we are on Gabriel-Max Straße, Friedrichshain’s brunch street. If you want to taste one of the best coffee in Berlin, this is the place! They have a nice selection of roasted coffee that you can also purchase at the shop. The staff is really friendly and nice and speak English. They have a big variety of food, organic eggs, bread, fresh fruits and vegetable, quinoa and pancakes! I had the rolled bread with bacon, fried organic egg, tomatoes and tomato relish and I’m still dreaming about that relish. I went on a Tuesday at 10:00 and the place was packed, so make sure you have ample time when you go. The café also offers vegan options like the cocoa-buckwheat granola with compote and coconut yoghurt or the banana bread. They staples like espresso, flat white and iced latte are made with coffee roasted by The Barn. Located at pleasant Böhmischer Platz in Neukölln, Australian-German dream team Katie and Flo are serving delicious breakfast with an Australian touch as eggs Benedict and pancakes. Their define vegetarian daily menu consists of five dishes. This coffee place is an hidden café close to the canal. Walking a long the canal, you can smell the roasted coffee being brewed at Concierge Coffee. The space inside is tiny and cozy. 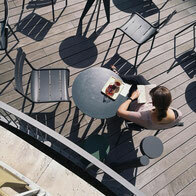 In summer you can sit on a large sunny terrace where you can drink your yummie coffee and enjoy the neighborhood. The area along Paul-Lincke Ufer is lovely and full of character. This place could not be more appropriately located. 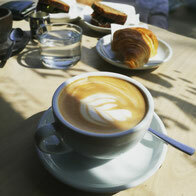 Here you can enjoy some exceptional freshly roasted coffee with a great view over the city. Café Kranzler is a very well recognized coffeehouse in West Berlin. Their coffee is known for high quality, brewed coffees with clean flavors. Hovering with a 360 degree view over Kurfürstendamm, you can watch the hustle and bustle of Berlin, meet friends or just enjoy your coffee on their large balcony offer plenty of outdoor space. This café is located on the second floor, you have two access it via the main staircase inside the Superdry Flagship Store. Located next to a children playground right across from the S Bahn Station Nordbahnhof. At Oslo coffee bar you order by espresso ratio. Of course you can have your “flat white”. Therefore you could go for the 1:1 espresso : milk. The café itself is cozy, rustic style and has a relaxing vibe.